So we of course have to sample all the local fried dough. My sister was virtuous and ran to the donut shop; I sat on the porch and drank coffee until it was time to go meet her with the car. While Duck Donuts has several locations throughout the Outer Banks, we're staying in Duck, so we visited the original shop- a tiny little storefront tucked into a soundside row of shops. And you gotta love a place that displays their process proudly (like taffy pulling or popcorn shops). I particularly enjoyed watching the exuder drop dough into the river of hot oil, as the donuts floated along like rubber ducks in a Blue Danube carnival game. Duck Donuts has lots of options for flavoring your donuts, which they do to order. Glazes, sprinkles, coconuts, etc. But we went with chocolate glaze and cinnamon sugar. I feel the cinnamon sugar is the true test of a good donut. These donuts are almost like a potato donut (seems like something they would make in Maine). They're cake donuts, but they are so moist. Usually cake donuts are dry and unappealing, but these were pretty awesome. And, of course, it helps that they were fresh out of the fryer and enjoyed on a porch overlooking the ocean. Tough life. 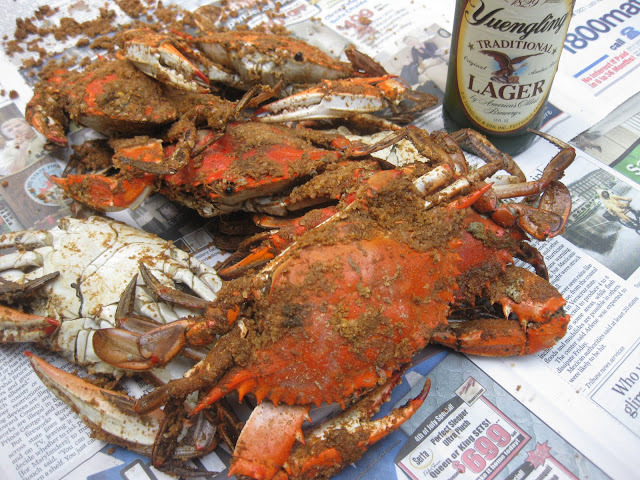 I went to visit my folks in Maryland this weekend, where summer is in full swing. I wore my bathing suit all weekend- in the sprinkler, the kiddie pool, and the creek (all with my 5-year-old nephew). I sat on the screened in porch and drank wine and saw fireworks on Saturday night. It was all pretty rad. But the best part about being in an area that 3 weeks of summer weather ahead of Maine? The produce. On the way back from the airport, I insisted that we pull over at the roadside stand that was selling tomatoes, melons, corn, and peaches. We bought a quart of perfectly ripe peaches and a half a dozen ears of local sweet corn. And then there was this lunch: roasted corn and avocado salad with basil white balsamic vinaigrette. 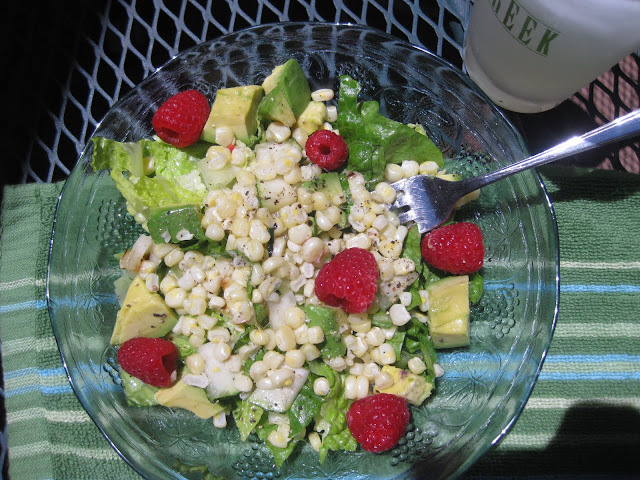 I was inspired by a roasted corn salad that had come with my mom's fried catfish at dinner out the night before. 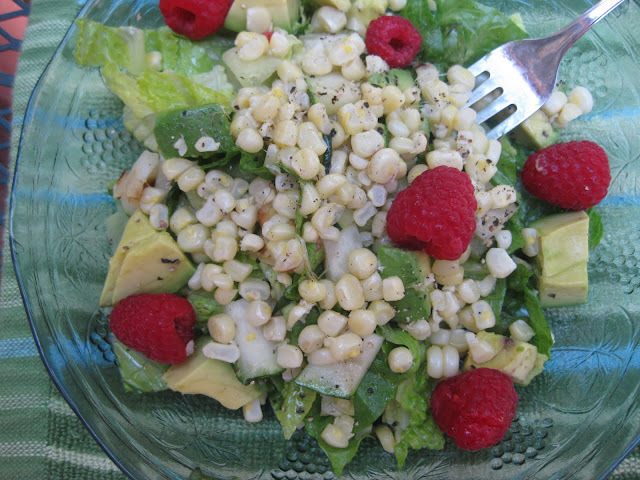 Seeking to lighten up our lunch, due to the heat, I roasted the corn and some zucchini on the grill and served them over chopped romaine and avocados. My mom added the raspberries in at the end, and it all came together so nicely. And then later in the weekend, this happened. Steamed crabs and Yuengling, y'all. I can die happy now. Muddle basil in vinegar and let stand for 10 minutes. Whisk in sugar, salt, and pepper. Slowly pour oil in a thin stream into the vinegar mixture while whisking. Serve over grilled corn and zucchini on a bed of romaine lettuce with chopped avocados and raspberries.